In all honesty, I’ve always loved the “Star-Spangled Banner.” My mind’s eye takes me back to the American Olympian who takes the podium, towering above the silver and bronze also-rans. Head held high in accomplishment, basking in the dignity of the feat he performed, the raw emotion displayed with a single hand over the heart, mouthing the words of his country’s anthem. Those moments would honestly take my breath away. What one man can and will do with his nation’s resources and support behind him? The Olympics, for me, is a display of just that. Our country – pushing one of its own to be his very best! Yet, now, we are faced with a choice. Stand up for love of country and love of flag or stand up for equality while kneeling in civil disobedience? I’ve been following the story of NFL player Colin Kaepernick and his decision to take one knee during the playing of the song I love so dearly while living in the country I love just as much. This song. The song which has stirred my soul at every Olympic game I’ve watched, at every basketball game at which I cheered, at every Super Bowl game I relished in (Whitney Houston remains the queen of the anthem, still). Yet, the song for me, is now in question. I didn’t get behind the Kaepernick “take a knee” movement – not because I didn’t think his cause had merit. I didn’t because not every symbolic movement is worth rallying behind. I hate discrimination and I hate prejudice. I hate violence and I hate racial profiling. But, I wasn’t moved by his choice. Perhaps I didn’t understand why this young man needed us to see the connection between the anthem and the ill-treatment of citizens who look like him. Wasn’t there a more expedient way to go about this? Now, I see it and here are 3 reasons I now balk at my once beloved “Star-Spangled Banner.” The man who penned the words “and the rocket’s red glare, the bombs bursting in air” did not write this song to include men and women who look like Kaepernick and myself. In fact, he despised us, subjugated us and didn’t want us to be member to “the land of the free” neither did he welcome us in to the “home of the brave.” How do I know this? Let’s look at the historical record at Smithsonian.com. 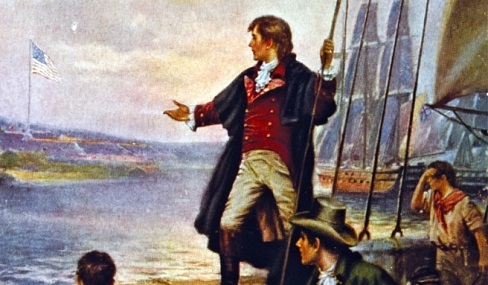 When Francis Scott Key wrote the poem that would, in 1931, become the national anthem, like many of our founding fathers, he had owned slaves. He was a very accomplished lawyer from an old Maryland plantation family who owned slaves. On the strength of a system that expolited humans for their free labor, his family sent him to school and groomed him for leadership in high society. They were rich and very powerful. Those are the forgotten verses in the anthem. They are never sung at sporting events for, if they were, Americans would be transported back to a time where slavery was the big difference between the British and the United States. Does it apply today? No and yes. Kaepernick and others do not believe we have left our racist past behind, especially as it pertains to the legal and criminal justice system. Yet, seeing that Key was party to that very system, the symbolic move of “taking the knee” to combat subjugation at the hands of law enforcement officers is in fact relevant. Key was stuck aboard a British ship near Baltimore in 1814 where he had been negotiating a prisoner release and barred by the officers of the HMS Tonnant from leaving because he knew too much about their position. For 25 hours, bombs and rockets rained down on Fort McHenry. He watched the battle from that ship and hoped for the best. The irony is that while Key was composing the poem, history tells us that black slaves were trying to reach British ships in Baltimore Harbor. They knew that they were far more likely to find freedom and liberty under the queen's Union Jack flag than they were under the Star-Spangled Banner. The British abolished slavery in 1833 -- that was three decades earlier than the United States. That very year, Key used his office as the District Attorney for the City of Washington to defend slavery, attacking the abolitionist movement in several high-profile cases. He would continue this fight for the next seven years. In 1836, shortly after a race riot in Washington, D.C. when an angry white mob descended upon a well-known free black restaurant owner, Key likewise sought to crack down on the free speech of abolitionists he believed were riling things up in the city. Key felt that abolitionists’ free speech rights were so dangerous that he worked to get Crandall hanged. He wasn't successful. So, does this evidence cause me to look at the song and its lyricist with new eyes? Yes. It turns my stomach to know that I-myself - was anti everything that Key stood for when he wrote my anthem. When I see how countries like South Africa go to the lengths of changing their anthem from "Die Stem van Suid-Afrika," a symbol of Afrikaner apartheid regime oppression, to adopting in 1997 the African hymn "Nkosi Sikelel' iAfrika," how I can oppose symbolic demonstrations against a song like "The Star-Spangled Banner," a song intended to inspire and unite all Americans at sporting events yet doesn’t truly represent the heart and struggle of all Americans? Kaepernick, you’re right. Now, let’s get it right.